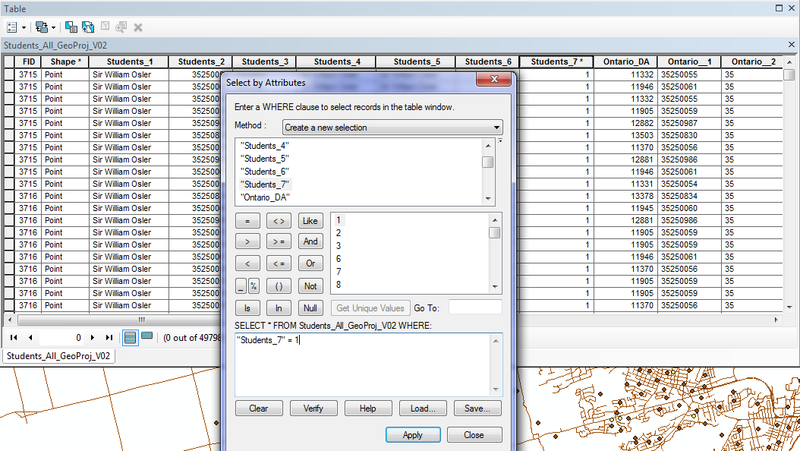 I came across an issue where I can no longer run a select by attribute on a field (In my example it is "Students_7") in a shapefile that previously worked. Even when I build the query using the wizard (see screenshot) it does not return any results. I tried making a new column in my shapefile, with the same datatype, and then used the field calculator to make my new field equal to Students_7. I then ran the same select by attribute query on this new field and it worked. Does anyone know why the select by attribute function no longer works on my Students_7 field? The only thing I did today, which is when this change happened, is join some files together, I've since gone and made sure to remove all other joins, I can see that "Students_7" is an indexed field, but I'm not sure how or when this happened. @Hornbydd suggested I look at the Index, and that seems to have been the root of the issue. I went into ArcCatalog to see about re-building the index, and when I went to the file properties>Indexes it said the layer did not have an index, so I created a new one. Then I went back into ArcGIS looked at my file's attribute table, and the asterisk over the Students_7 field disappeared and select by attribute now works, so I guess it did get corrupt or something. Not the answer you're looking for? Browse other questions tagged arcgis-desktop arcgis-10.3 select-by-attribute or ask your own question.